Iran has a strategic interest in Afghanistan as it comprises most of its eastern border. In addition, Afghanistan holds a significant Shia population which Iran has a special relationship with. Other factors such as border security, water rights, the drug trade, and commercial ties have Iran's attention on Afghanistan. Iran's Interests in Afghanistan. Iran has been a matter of concern to the NATO alliance and has presented some challenges in Afghanistan for the last decade and more. With the recent drawdown of NATO forces in Afghanistan Iran is likely to increase its influence in Afghanistan. Iran's influence can be found in the economic, political, cultural, and religious areas of Afghanistan. Water Rights. 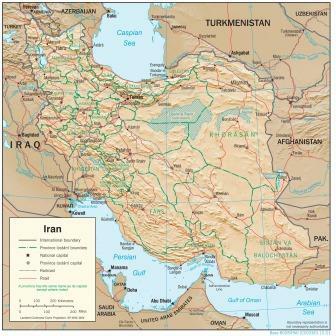 Some of the water that Iran uses for its population and agriculture comes from the rivers that originate in Afghanistan and cross the border into Iran. Aghanistan is a water-poor country as well and it has and is building several dams that will provide for efficient irrigation of agricultural land in Afghanistan as well as generate electrical power. So there's the rub. The more water that gets used in Afghanistan the less water that enters Iran. Afghanistan has accused Iran of supporting Taliban and criminal groups that have attack the dam building projects of western Afghanistan. 1. Afghan Fatemiyuoun Division in Syria. Iran has fully supported the Syrian regime in the long-running conflict against Syria separatists. Part of this support is the funding and fielding of it's 'foreign legion' made up of Shia fighters from the Middle East and beyond. A large part of this foriegn fighter contingent is the Afghan Fatemiyuon Division. The Shia volunteers of Afghan origin come from Syria, Iran, Afghanistan, and other countries. 3. Support of the Taliban. One of the concerns the U.S. and its allies have are reports that the Iranians are supporting the Taliban in western Afghanistan. One of the reasons cited for this support is that Iran is hedging its bets - it is concerned the Afghan National Defense and Security Forces (ANDSF) will lose the fight to the Taliban. 2. June 30, 2017. "How Iran Recruited Afghan Refugees to Fight Assad's War", by Ali M. Latifi, The New York Times. A profile of Afghans from Bamian pressed into service to fight for Iran and Assad in Syria. December 24, 2016. "Iran, Russia See Opportunity to Encircle the US in Afghanistan", The Diplomat. June 6, 2016. "By Befriending The Taliban, Iran Hedges Bets in Afghanistan, Analyst Says", Gandhara Blog. June 11, 2015. "Iran Backs Taliban With Cash and Arms". The Wall Street Journal. The Shiite nation has quietly boosted ties with the Sunni militant group and is now recruiting and training its fighters. February 11, 2015. "Elephant in the Jirga: Iran's interests in Afghanistan - Analysis". Eurasia Review. 1. John Nixon, A former senior leadership analyst for the Central Intelligence Agency provides information about the water crisis in Iran and how it affects that country's relationship with Afghanistan in "What's Next for Afghanistan and Iran? Water Wars", The Cipher Brief, September 27, 2017. 2. Anthony Cordesman of the Center for Strategic and International Studies (CSIS) is interviewed on Iran's strategic interests in Afghanistan in "Afghan Opium Trade Sticks a Thorn in Iran's Side", The Cipher Brief, September 27, 2017. 3. Ali Alfoneh provides a detailed account of the foreign fighters employed by Iran in Syria in Tehran's Shia Foreign Legions, Carnegie Endowment for International Peace, January 30, 2018.